At our recent Paso Robles wine dinner at BLT Prime, all four wines poured that evening were excellent, as Kathryn reported, but one wine in particular — the 2007 Tablas Creek “Esprit de Beaucastel” Rouge — simply floored us. 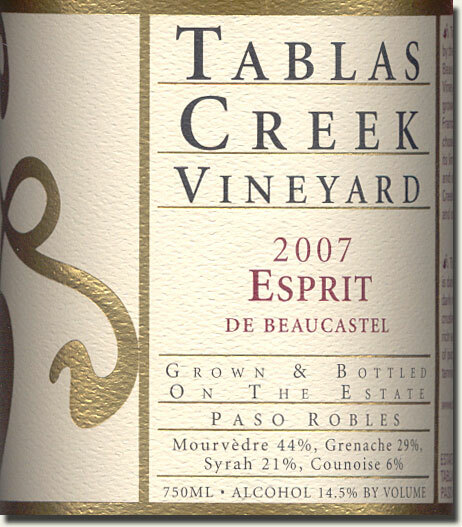 Jointly owned by the Perrin family of Chateau de Beaucastel and the Haas family of Vineyard Brands, Tablas Creek was established in Paso Robles in 1989 due to its geologic and climatic similarities to the famed Chateauneuf-du-Pape (CNP) appellation in France’s southern Rhone region. The aim: to make California wines in the same styles and quality as CNP. Two decades (and change) later, the 2007 Esprit, the “hommage”, just might have surpassed the original role model. A true “Rhone Ranger” from a near-perfect growing season, the Esprit is a blend of estate-grown Mourvedre (44%), Grenache (29%), Syrah (21%) and Counoise (6%), all Rhone varieties planted in Paso Robles from cuttings from the vineyards of Chateau de Beaucastel. It’s a thrilling wine: aromatic, complex, full-bodied and highly drinkable, with supple tannins and a lively spine of acidity. Deep briar fruit and dark cherry on the nose and palate, along with loamy earth, Kalamata olives and hints of spice and conifer on a long, energetic finish. And a perfect match for the toothsome rack of lamb at BLT Prime. This could easily pass for a CNP from a stellar vintage, if not Beaucastel itself! The key to this smashing success (beyond a great vintage)? The quality of the Mourvedre, says Jason Haas, general manager of Tablas Creek, which is also a major component of Beaucastel. “At this point, we believe Paso Robles is the best location on the planet for Mourvedre,” he said. A bold claim. Better than in Bandol, where it’s the anchor variety for meaty reds and quality rosés? I asked. 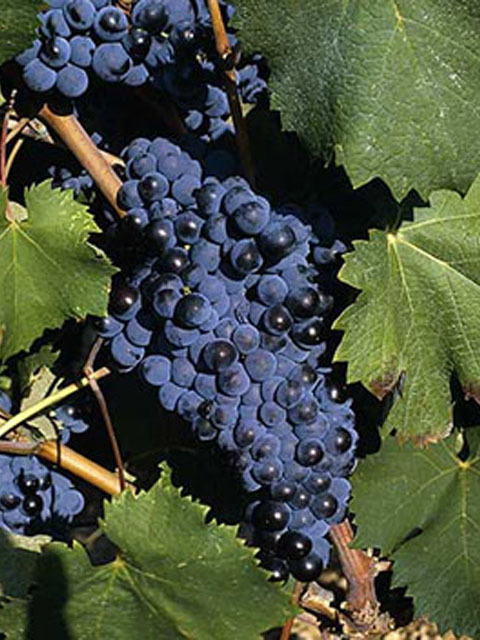 The French Riviera has warmed up in recent decades, answered Haas, causing the day-night temperature differentials in Bandol to be much narrower than in the past, resulting in Mourvedre-based wines often well above 15% ABV. Though Paso Robles gets the intense heat required to ripen the slow maturing Mourvedre, it still has diurnal temperature swings of 30 to 40 F, which helps maintain the grape’s acids and promotes full phenolic ripeness, at balanced alcohol levels, mostly under 15%. With the 2007 Esprit de Beaucastel, one of the most compelling California wines we’ve had in some time, I can only agree with Jason. Understandably sold out at the winery, it’s still available on some restaurant wine lists and in limited quantities via on-line outlets (check out winesearcher.com), starting around $40.00. This entry was posted in New York City, Wine and tagged 2007 Esprit de Beaucastel, Bandol, Chateau de Beaucastel, Chateauneuf-du-Pape, Mourvedre, Paso Robles, Rhone Ranger, Tablas Creek. Bookmark the permalink. Thank you, Christopher! Because we’ve been out of the wine for a while at the winery, I hadn’t had a chance to check in on it recently. I was impressed, too, with how well it showed. It’s come a long way even in the last six months. I should clarify that I think Paso Robles has the potential to be the best site for Mourvedre on the planet… not Tablas Creek specifically. Just a great combination of limestone soils, lots of sun, a long growing season and big temperature swings. Good in general, but particularly so for the very late-ripening Mourvedre grape.